Webster Hall was built in 1886 by architect Charles Rentz in the Queen Anne style and topped with an elaborate mansard roof. Six years later in 1892, Rentz was hired to design an addition to the building, occupying the site of 125 East 11th Street and designed in a Renaissance Revival style using the same materials as the original building. Throughout the early twentieth century the building was plagued by fires, which occurred in 1902, 1911, 1930, 1938, and 1949. The original mansard roof was likely lost in one these fires. Webster Hall became the country’s first modern nightclub. It was a place where one could witness figures such as Emma Goldman, the outspoken exponent of Anarchism, herald the cause of free love and birth control on one night and, on the next night, see the refined atmosphere and grace of a society function celebrating New York’s elite. Margaret Sanger led strikers to the building in 1912. Other patrons from the club's early years include painters Marcel Duchamp and Joseph Stella. During Prohibition, the theme of the balls held within the hall moved from the social and political trends to the hedonistic attitude of the speakeasy. Local politicians and police were said to turn a blind eye to the activities, and it was rumored that the venue was owned by the mobster Al Capone. The repeal of Prohibition was the reason for one of Webster Hall's biggest celebrations, "The Return of John Barleycorn." In the 1950s, Webster Hall began featuring concerts from a diverse group of artists. Latin performers, such as Tito Puente and Tito Rodriguez played at the club. So, too, did folk artists Pete Seeger and Woody Guthrie. Then RCA Records recognized the acoustical integrity of the building and converted it into their East Coast recording venue, Webster Hall Studios. Carol Channing recorded Hello, Dolly! there, Harold Prince recorded Fiddler on the Roof, and artists such as Julie Andrews, Harry Belafonte, Tony Bennett, Ray Charles, Perry Como, Sergio Franchi, Peter Nero, Elvis Presley, and Frank Sinatra all recorded in the studio. In 1992, the Ballinger Brothers unveiled the restored Webster Hall, featuring state of the art audio, video, and lighting technology with the original color scheme recreated. The venue hosted two or three different genres of music at once on weekend evenings, providing rave/house music in their large dance room and rock in the upstairs billiard area. A facility capable of catering to groups of 100 to 2,000, Madonna, Mick Jagger and Bill Clinton have had events there, as has the World Wrestling Federation TNA Wrestling and the taping of Fuji Television Network's Iron Chef "New York Special" between Bobby Flay and Masaharu Morimoto. The venue offers five different rooms. Canopy and lighting sconce over side doorIn addition to its weekly club nights, Webster Hall is one of the city's premiere live music venues. It is the exclusive live music venue for AOL’s New York Broadband Rocks series. On May 11, 2007 Linkin Park filmed their Minutes to Midnight Promo Concert, which was then released into theatres. The club recently entered into a partnership to present The Bowery Ballroom Presents at Webster Hall concert series, which has already brought such acts as Sonic Youth, Infected Mushroom, The Hives, John Mayer, John Butler and Modest Mouse to the mainstage. 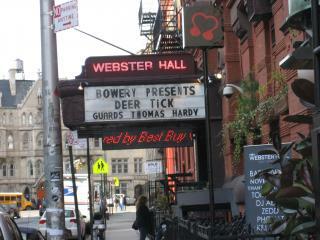 In October 2008, Webster Hall opened its newest room "The Studio at Webster Hall", a 300 capacity performance space.